Lightweight, Comfortable, Cool, Porous. Tartan introduces the light knee support. This material wicks away perspiration which promotes healing and enhances patient comfort and compliance. It has three generous foam inserts for positive skin traction and the design of the velcro closures offers considerable versatility, including the ability to fit the extreme tapered leg. This brace may be used following surgery, ligament injuries, fractured or dislocated patella and Osgood Shlatter's Disease. Constructed of the traditional sturdy canvas/foam/flannel material. It has three generous foam inserts for positive skin traction and the design of the velcro closures offers considerable adjustability, including the ability to fit the extreme tapered leg. This brace may be used following surgery, ligament injuries, fractured or dislocated patella and Osgood Shlatter's Disease. Constructed of canvas/foam material. 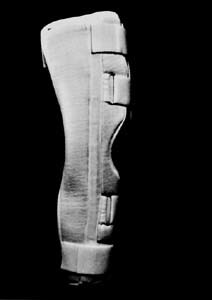 It has 3 posterior stays and one medial and lateral stay. It is a very efficient splint. 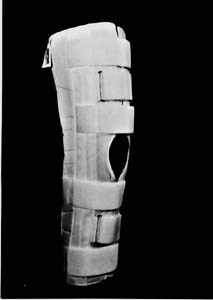 This brace may be used following surgery, ligament injuries, fractured or dislocated patella and Osgood Shlatter's Disease. Ped 12 - 15" L 18 - 21"
S 14 - 17" XL 20 - 23"
M 16 - 19" XXL 22 - 25"
The tree panel construction means no trimming and an accurate fit every time. 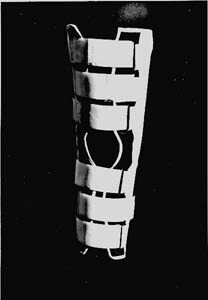 The posterior panel has 3 stays and the two sides have two medial and lateral stays. 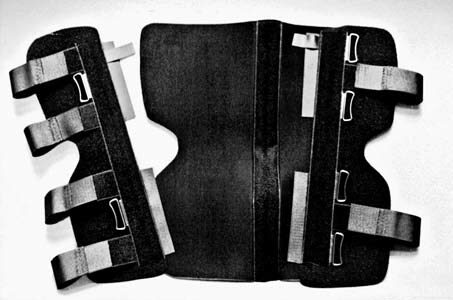 The two side panels attach to the posterior panel with velcro. The design of the velcro closures offers considerable versatility, including the ability to fit the extreme tapered leg. This brace may be used following surgery, ligament injuries, fractured or dislocated patella and Osgood Shlatter's Disease.